On Friday the 26th Feb 2011 I was honoured to receive recognition by Microsoft for contributions to the Microsoft online technical communities with the Microsoft Community Contributor Award. I would like to thank the Microsoft Community & Online Support Team for this award and congratulations to all others that have received the MCCA for all your hard work. This entry was posted in Information, MS CRM and tagged Award, CRM 2011, MCCA, Microsoft Community Contributor Award, Microsoft Dynamics CRM 2011, online, Rhett Clinton, Technical on February 27, 2011 by Rhett Clinton MVP. 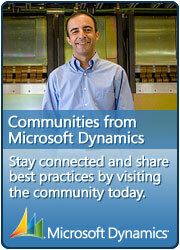 This last month has been quite hectic and people may have noticed my minimal presence within the Microsoft CRM Forum. In the last few weeks I have been finishing up on my projects at Panacea and have now moved onto Infusion Development in London. Over the next weeks I’ll hopefully get more time to get back into the forums and continue to add to my blog (hopefully with interesting articles for you all). I’m really excited about the new role and I can’t wait to start writing about CRM 5 for you, so stay tuned and hopefully we can all learn something new in the next few months. This entry was posted in Information and tagged Infusion Development, Rhett Clinton on June 15, 2010 by Rhett Clinton MVP.